SHIPWRECKED! After their perilous encounter with the sea-witches, Walker and the pirate crew of the Jacklight find refuge on a deserted island. But it might not be as deserted as it seems—shadowy creatures have been spotted in the jungle, and strange animal tracks appear overnight. When Walker, Shiv, and Genoa discover a secret passage and mysterious ruins, the dark history of the archipelago begins to unravel. Legend tells of a mad king, a fallen civilization, and a powerful royal family in search of their lost sister. And for reasons Walker can’t understand, Genoa seems to be at the center of it all. 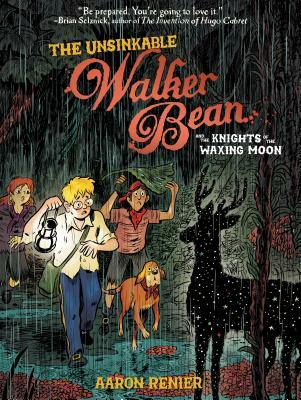 In this triumphant follow-up in the epic Unsinkable Walker Bean graphic novel series, Aaron Renier is back with more breathtaking art and high-sea adventure, The Unsinkable Walker Bean and the Knights of the Waxing Moon. AARON RENIER was born and raised in Green Bay, Wisconsin. He has been drawing comics, in one way or another, for as long as he can remember. His illustrations have appeared in a wide variety of places, including turning an entire city bus into a moving aquarium. He won the Eisner award for cartoonist deserving wider recognition for his first graphic novel, Spiral-Bound. He is the illustrator of a series of books about the knights of the roundtable by Gerald Morris, and a picture book by Alice Shertle titled An Anaconda Ate My Homework.